The first step in the LASIK procedure is to perform a series of tests to determine the individual characteristics of your vision, including the use of our CustomVue iDesign technology. The iDesign system creates a 3-D map of the unique imperfections of your eyes. 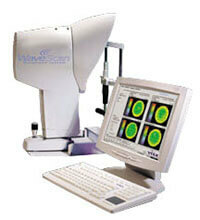 The CustomVue WavePrint Map provides a precise, more detailed analysis of the way your entire optical system operates. With the CustomVue WavePrint Map, Dr. Lipsky can create a detailed understanding of your vision correction needs for the development of your personalized laser vision plan. 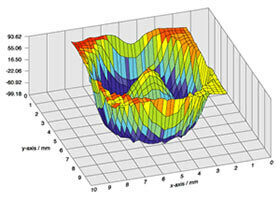 The CustomVue iDesign System acts as the guidance system for our VISX Star S4 Excimer Laser. This allows Dr. Lipsky to provide you with laser vision corrections based on measurements 25 times more accurate than are possible with any system used to produce glasses or contact lenses. The final result is a treatment as unique as your DNA or your fingerprint. Our iLASIK procedure is quick, safe, and generally described as pain-free. The eye surgery itself typically takes no more than 20 minutes. On the day of the procedure, your unique correction information is transferred directly from the CustomVue iDesign to the VISX Star S4 Excimer Laser. You will receive a mild oral sedative to help you relax, but you will remain alert and comfortable during the procedure. Before the procedure, we will administer anesthetic eye drops to ensure your comfort throughout. You will lie on a table beneath the laser equipment during the procedure. Each eye will be treated individually while being held open by a speculum. Step 1 – Dr. Lipsky creates a tiny-hinged flap on the surface of the cornea. LASIK surgery utilizes the IntraLase Laser which is a new state of the art femtosecond laser treatment that creates the LASIK corneal flap by using a blade-free computerized laser technique. With the IntraLase Method, tiny pulses of laser light pass harmlessly through the outer surface of the cornea, forming a uniform layer of microscopic bubbles just under the surface. Dr. Lipsky determines the exact dimensions of the bubble layer and this is all computer controlled for maximum precision. He is then able to gently separate the layers, creating the flap. Step 2 – Dr. Lipsky lifts the corneal flap, the 3-D Auto-Tracker is engaged, and Iris Registration is confirmed. After this confirmation, the actual laser vision correction is performed. The cornea is reshaped in a way that is uniquely safe and predictable, employing the Advanced CustomVue iDesign method on the VISX Star S4 Excimer Laser. 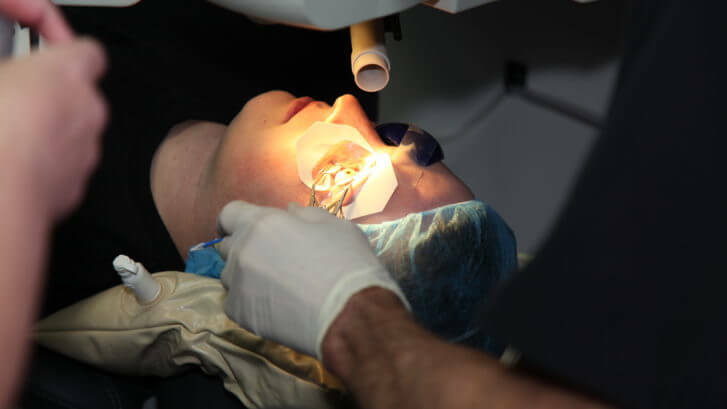 When this reshaping is complete after several seconds of treatment, the flap is gently replaced in its original position, where it literally “locks” back into place due to its precise shape, and your eye heals very quickly over the next several hours. Once the LASIK procedure is completed, you are advised to go home and rest, keeping your eyes closed as much as possible for the remainder of the day. Antibiotic, anti-inflammatory and lubricating eye drops will be prescribed. Activities that strain the eyes – reading and computer – should be avoided for 24-48 hours. You may watch TV or movies after six hours. You will have a follow-up appointment the day after surgery. While each person’s comfort level may differ, you may experience mild side effects that include tearing, sensitivity to bright lights and a feeling of “scratchiness”. Your vision may be somewhat hazy at first, but over time, these side effects should disappear. You can enjoy your normal activities with dramatically improved vision! LASIK isn’t for everyone, what are other options?